Storage maker Seagate has announced a new NAS storage drive for small business, personal cloud and multimedia storage. The device is available in 1,2,3,4,6 and 8TB storage capacities. It is compatible with 1 to 8 bay enclosures. The new drive can withstand workload rate limit (WRL) of 180TB/year which is the WRL for this category. The drive has a MTBF (mean Time between Failures) of 1 million hours and comes with a three year limited warranty. Seagate is also providing a new optional three year Rescue Data Recovery service to protect the drive against any kind of potential data loss. Seagate Technology plc, a world leader in storage solutions, today announced the launch of the Seagate NAS HDD 8TB, the world’s highest-capacity drive optimized for RAID, Network-Attached Storage (NAS) and server storage. These reliable, scalable drives address the ever-growing data challenges for the Small- and Medium-sized Businesses (SMB), Small Office/Home Office (SOHO) and creative professional segments. 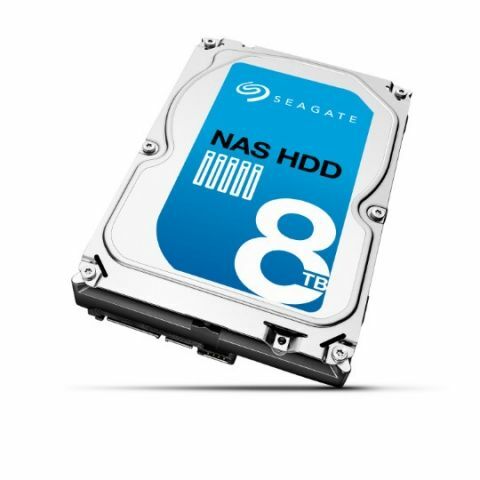 The Seagate NAS HDD 8TB is the largest NAS optimized drive on the market. That means businesses will require fewer drives—and subsequently fewer expensive enclosures—to meet their data storage needs. The new 8TB drives are designed for tower enclosures with one to eight bays, delivering up to 64TB in a single eight-bay desktop form factor. This high storage density gives small business the high capacity and flexibility to address the data challenges on the immediate horizon while preparing for the future. Data volumes continue to increase at an astounding rate, with IDC’s Digital Universe Study forecasting that the world’s annual data creation will increase by ten-fold between 2013 and 2020 to 4.4 zettabytes. Seagate’s own research has revealed that SMBs in particular are choosing NAS solutions over other storage technologies such as storage area networks (SAN) and direct attached storage (DAS) to help manage this looming surge in data. Of the people who preferred NAS, 18% do so because of price, 16% for ease-of-use and 10% for quality. The new Seagate NAS 8TB HDD is optimized for a diverse set of NAS use cases including backup and disaster recovery, print and file servers, multimedia storage, archiving, file sharing and virtualization. In addition, industry-leading NAS manufacturers including ASUSTOR, QNAP, Synology and Thecus have qualified the NAS HDD 8TB for compatibility in a number of their products. The new Seagate NAS HDD 8TB has shipped to select customers, with wide-scale availability at the end of the current quarter.